A promising set of over ears with clever Google Assistant integration, we look forward to seeing if the audio can match the inventive design with the JBL Everest 710GAs. It’s all well and good having a voice-controlled smart helper in your phone like the Google Assistant, but if you’ve got to pull your handset out of your pocket to activate it when you’re out and about, that hands-free appeal starts to fade. 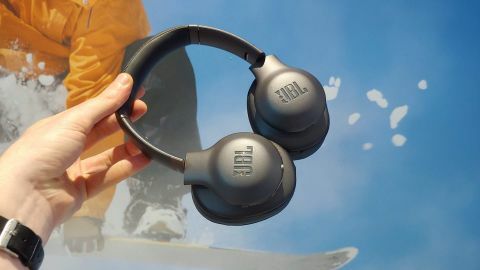 At IFA 2018, JBL set to make getting chatty with an AI assistant a little easier with the launch of its JBL Everest 710GA over-ear wireless Bluetooth headphones. Set to be accompanied by an in-ear wireless pair (the Everest 110GA), they offer access to the Google Assistant at the touch of a button. We had a brief hands-on test of the cans at the Berlin show. Launching later this year, the JBL Everest 710GA will cost £229.99 (around $300 / AU$400) . The JBL Everest 710GA are a slick-looking set of headphones. Grey with bronze detailing, they offer cushioning across the top of the headband, and luxury leather style coverings over the padded ear cups. The padding is quite soft, supporting the headset without squeezing in too closely to the listeners head. Expanding large enough for a bigger head to handle, the Everest 710GAs grip the head well without being uncomfortably tight, and can fold down flat thanks to the twisting ear cups. Though we’ve yet to have enough time with the headphones to put the claim to the test, we’re told you can expect to get 25 hours of wireless playback per 2 hour charge from the headphones. A hard carrying case is also part of the package, giving you somewhere top pop your headphones safely away when they’re not in use. In terms of looks, our one gripe is with the glossy JBL logos on either ear cup. It’s a bit big, and a bit in-your-face for what would otherwise be an attractively unassuming set of cans. But it’s when you start playing with the left ear cup that things start getting interesting. It features a touch-sensitive panel that, when tapped or pressed, can activate the Google Assistant from your connected phone. With a single press you can get quick information like the weather or notifications, while keeping your finger on the sensor activates the ability to ask the Assistant all the standard questions it can answer, from playing your favorite tunes to asking for nearby landmarks. Though the demo unit we tried could only deliver a preset response to a tap, the panel itself was very easy to activate. There’s no searching around for a button, with just a light touch giving Google Assistant the signal to start listening. However, if you’ve a habit of readjusting your headphones while wearing them, you may have to be careful not to press onto the left earcup, or find yourself annoyingly activating the helper by accident. As well as the Google Assistant feature, the Everest 710GAs also offer ShareMe 2.0 connectivity, letting you broadcast your tunes to owners of any other Bluetooth headset nearby, and an echo-cancelling mic for improved call audio. In addition, you’ll find standard hardware controls on the right hand ear cup, with power, play, pause, volume and skip track controls at hand. There’s also a port for a headphone cable to be plugged in, should you want to avoid relying on the wireless connection. Our time with the JBL Everest710GA headphones was limited, and we had only a brief and random selection of dance tunes to listen to before having to put them back into the hands of a JBL spokesperson, but that short listening session proved promising. Using 40mm drivers and with a frequency response range of 10Hz - 22KHz, it was a clean and punchy sound, if not the most detailed performance we’ve heard. They felt comfortably light on the head, and with the convenience of the Google Assistant function they set be a welcome commuting companion. There’s lots to like about the JBL Everest 710GAs. They’re comfortable to wear, attractively designed and feature useful smart assistant integration. We’ll need more time to judge the performance of their audio, as well as put to the test whether or not accidental presses of the Google Assistant button prove unduly annoying. But it’s already looking like a smart set of headphones for a smart assistant obsessed age.